If you like motorcycles, Harley Tracks: Across Vietnam to the Wall (Tracks Press, 263 pp., $29.95) has to be your next book. True to his subtitle, author Mike Rinowski describes practically every mile of an amazing journey he took on a Harley Fat Boy. Over four years beginning in 2008, Rinowski traveled 41,000 miles on a solo pilgrimage to honor those who fought in the Vietnam War—or, depending on your viewpoint, the American War in Vietnam. He visited most of the battle sites, including those from the French War, including Dien Bien Phu. Despite the author’s intent to honor warriors from the past, Fat Boy steals many of the scenes. The Harley “added a new tune to the atmosphere” and attracted attention everywhere, which helped Rinowski meet many people, including veterans from both sides. Hotels frequently gave Fat Boy privileged parking—inside their lobbies. Fat Boy and Rinowski conquered all: close calls, treacherous roads, monsoons, overzealous police, mechanical difficulties, collisions and spills, along with other unpredictable problems. Every day was an adventure. Forty pages of colored photographs are flawless. They show people, cities, and landscapes with vividness and clarity seldom found in a memoirist’s photography. 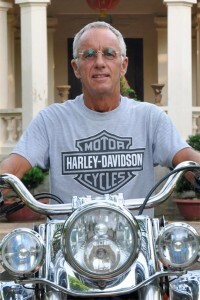 Rinowski also rode across Kashmir and through the Himalaya Mountains on a rented machine. As he traveled, Rinowski occasionally updated the status of his business ventures as a golf course builder and superintendent. Born in 1953, Rinowski entered the Army and ended up serving in Germany as the fighting in Vietnam wound down. Rinowski fulfilled the promise of the book’s title after returning to the United States. In 2013, Fat Boy and he joined the Memorial Day rally that ended at the Vietnam Veterans Memorial in Washington, D.C.
Mike Rinowski’s preference to travel alone—the most dangerous way to ride—distinctly confirms that essence. 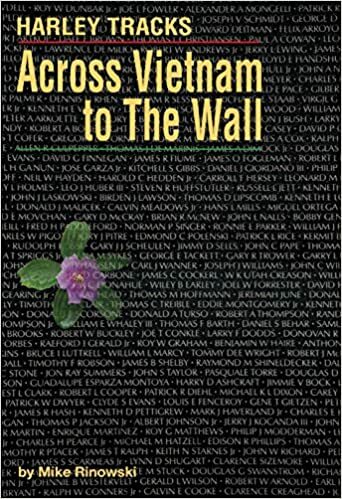 This entry was posted in Nonfiction, Vietnam War, Vietnam War History and tagged Across Vietnam to the Wall, Harley Tracks, Mike Rinowski, Rinowski, The Wall, Vietnam Veterans Memorial, Vietnam War by vvaposted. Bookmark the permalink.